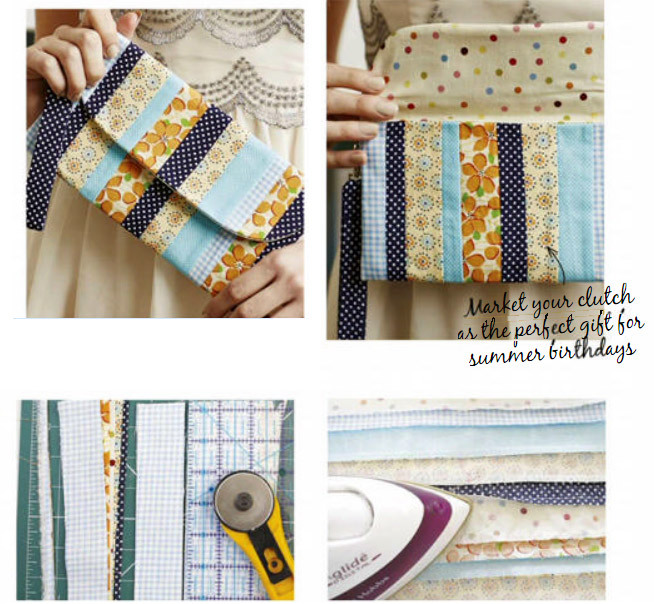 How to Make Patchwork Clutch Bag. Tutorial ~ DIY Tutorial Ideas! Everyone who enjoys patchwork ends up with a whole stash of fabrics – not only because when you go shopping the fabulous colours and patterns are so irresistible but also because you rarely use upall the fabrics bought for a particular project. 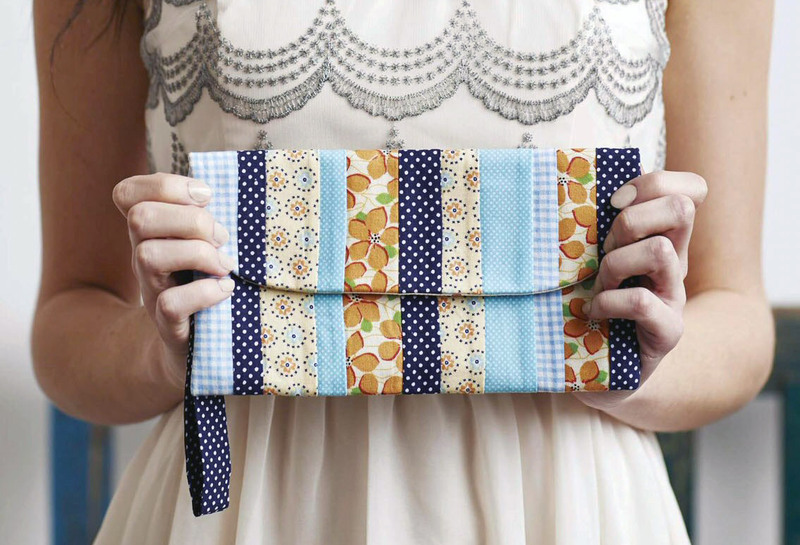 This little clutch bag is the perfect way to make headway into that stash, especially the smaller pieces as you can join them up to make longer strips if necessary. The pattern has been cleverly worked out so that the finished clutch bag is neatly lined with a contrast fabric and all raw edges hidden! Such professional finishing details and quick additions, like the carrying strap, mean you can sell at a higher price with more profit for you. 1. Cut five pieces of coordinating cotton fabric each measuring about 15 x 40cm. Layer the pieces together so that theedges are level on one long side. Using a quilting ruler and rotary cutter cut strips of the fabric in different widths measuring around 2.5-4cm. 2. Arrange the strips on the work surface to create a balancedlook in width, pattern and depth of colour. Stitch the strips together in pairs and then stitch the pairs together using 0.5cm seam allowance. Press the seams in one direction (press dark-coloured seams onto the dark fabric). 3. Iron interfacing onto the reverse side of the patchwork, then iron a second piece on top if you require extra stiffening. Place the patchwork on the cutting mat, lined up with the grid lines. Trim the edges straight and square to create a rectangle measuring 25 x 35cm. 4. Use a 10cm diameter dish or container to mark and round the corners at one end of the patchwork panel to create the flap shaping. Cut the lining fabric crossways to make a 13 x 25cm and a 21 x 25cm piece. Round two corners at each end of the longer edge of the larger piece. 5. Insert pins 24cm up from the short straight edge of the shaped panel on both sides to mark the start of the flap. Pin the lining fabric onto the flap right-sides together. Machine stitch around the curve end between the pins, reverse stitching at each end for strength. Snip at the end of the stitching and notch the curves. Sew the rectangle of lining fabric to the other end of the patchwork panel. 6. Turn the flap through, and press with a steam iron. Fold the patchwork right-sides together matching the seams at the edge of the flap. Pin the lining side seams as well, trapping the flap inside. Machine stitch the side seams from the folded edge, reverse stitching as you cross the point where the flap starts. Keeping the flap out of the way, sew the lining side seams and 2-3cm across the bottom edge of the lining. Repeat with the other side seam. 7. Trim across the corners and turn the clutch bag through. Use a chopstick or similar tool to ease out the corners. Sew across the gap in the lining. Turn the bag through and press. Open the jump ring and feed it into the stitching on the side seam of the bag. Bring it out again several stitches down and then close the ring with pliers. 8. Cut a 4 x 60cm piece of fabric. Fold in half and stitch the side seams. Turn through and press. Tuck the neat end through the loop on the spring hook. Fold the strip in half to tuck the raw edge under the other end. Sew in a square to secure the bag strap and hide the raw edges. Attach to the jump ring on the bag, to finish.